Caller: "Can I speak to Kate Adie?" ..... BBC: "Who?" - Salut! Caller: "Can I speak to Kate Adie?" ..... BBC: "Who?" 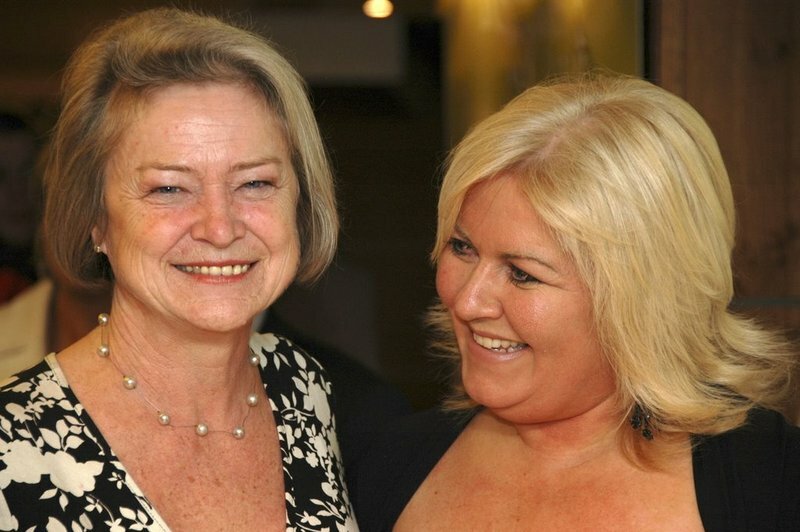 Kate Adie opening the Dream Big photographic exhibition of the Irish charity To Russia With Love, with Debbie Deegan, the charity's founder, on the right. In today's edition of Abu Dhabi's new paper, The National, my colleague Philippa Kennedy has a terrific feature about Kate Adie (left), whom she interviewed when the BBC stalwart paid a flying visit to Dubai to launch an international festival of literature to be held next year. Philippa mentions the 2003 rumours, which accompanied reports that the reporter was stepping down as the BBC's chief news correpondent, that she had been sidelined on the instructions of the corporation's top brass, supposedly "fed up with her opinionated reports that often upset politicians". It reminded me of an unusual morsel of evidence of Kate's declining prominence that came my way before she lost the role. Kate shares my passion for Sunderland football club, having grown up in the city (in those days quite happy to be a town) and, like me, spent far too many hours of her youth standing on the terraces of Roker Park. We talked about this little thing we had in common while doorstepping a government ministry ahead of some important announcement back in the 1970s, when she was already a star of TV news and I was a scruffy Press Association hack. Over the years, we met occasionally on assignments in Britain and abroad, and I always liked her and her blunt and fair approach to reporting, even if she could never quite be called unassuming. Twice, she readily agreed to give up time to be interviewed as a celebrity supporter of Sunderland, first for the fanzine A Love Supreme (the article was headed Famous on the Fulwell, though her regular spot in the ground was just around the corner in the main stand paddock) and then, some time in 2002, for the magazine of the London branch of the supporters' association, a publication cleverly called Wear Down South. For the second interview, we agreed to meet for coffee on the roof terrace of the Royal Institute of British Architects, just down the road from the Beeb in Portland Place. When she failed to show up, I began telephoning the BBC. "Scandalously," as I noted in the ensuing write-up, "two switchboard operators denied knowledge of her. 'How were you spelling the surname?' asked one." It was scandalous because Kate was at the time Britain's best-known television reporter. Fortunately, I was able to get through to the newsroom and ask a colleague to pass on my mobile number. Kate immediately responded, calling me to report some insurmountable problem with her car and switching the meeting to beers by the river - on her - later in the day. Wear Down South's circulation must at that time have been all of about 500. Kate's insistence on being utterly professional in sticking to a promise, even one made to such a piddling little publication, came as a breath of fresh air. But I wonder whether she ever got round to fulfilling the most engaging ambition she mentioned when we met. Among her awards, Kate is a Freeman of Sunderland. "This entitles me to drive my sheep across Wearmouth Bridge," she told me. "And one day, even if it's just one sheep, I fully intend to do so."